No doubt due to living through the austerity of the Second World War, my former father-in-law was known to mend some items of broken crockery with araldite, and return said-damaged items back into domestic circulation! I used to hate eating off the mended plates, not only from a hygiene point of view, but from an aesthetic angle too, although Grandpa didn’t seem to mind about either! I don’t suppose the makers of araldite EVER considered adding paint to make their glue more beautiful! However, if they’d had a Japanese influence on their product development team, they might have considered it. 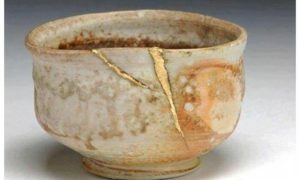 Kint-sugi (literal translation: golden repair or joinery) is the ancient Japanese art of repairing broken pottery with lacquer which has been mixed with powdered gold, silver or platinum. The philosophy behind this comes from the idea that damage and subsequent repair are part of the history of an object, rather than something to hide, and this in turn comes from the concept of wabi-sabi, or ‘flawed beauty’. There would be little or no point of repair if the dish were cheap and/or easily replaceable, but for something of more value and beauty, it makes complete sense to do it. Nowadays, the whole concept of wabi-sabi is applied in many areas of life, but it had it’s roots in philosophy and religion. Zen Buddism engages the idea that materials that age such as wood, paper and fabric become more interesting as they exhibit change that can be observed over time. So what springs to mind when I look at the attached photo of the damaged and repaired bowl? I think of how we could transfer the principle of wabi-sabi to human beings, that we could embrace the ‘damage’ rather than hide it away? Human ‘flawed beauty’? How many times have you pretended things were fine when they ABSOLUTELY weren’t and not shared your true feelings? Isn’t it the hurts and challenges of life, when we’re under pressure and stress, that give us our greatest learnings, insights and connections with other human beings? Perhaps we could embrace and share these challenges as the ‘experiential gold’ they are, hopefully leading us to become more tolerant, kind and back in touch with our humanity?